When you think of Japanese cuisine, images of sushi, sashimi, ramen noodles and tempura probably come to mind. However, you might be surprised to learn that another popular and famous food here is curry. The taste of Japanese curry is usually sweeter than the more heavily spiced Indian or Nepalese curries. It also differs from popular Thai curries, which uses coconut milk and different spices. Japanese curry is both rich and aromatic, making it a favorite dish with both locals and foreigners. There are dedicated curry restaurants such as the well-known Curry House CoCo Ichiban ya. Many other Japanese restaurants offer a standard curry dish, particularly on lunch menus. Going to a restaurant specializing in curry is a real treat, but you may not know that it is also very easy to make this kind of curry at home. A few simple ingredients combined in the right way, and you can be enjoying restaurant quality curry in your own home. 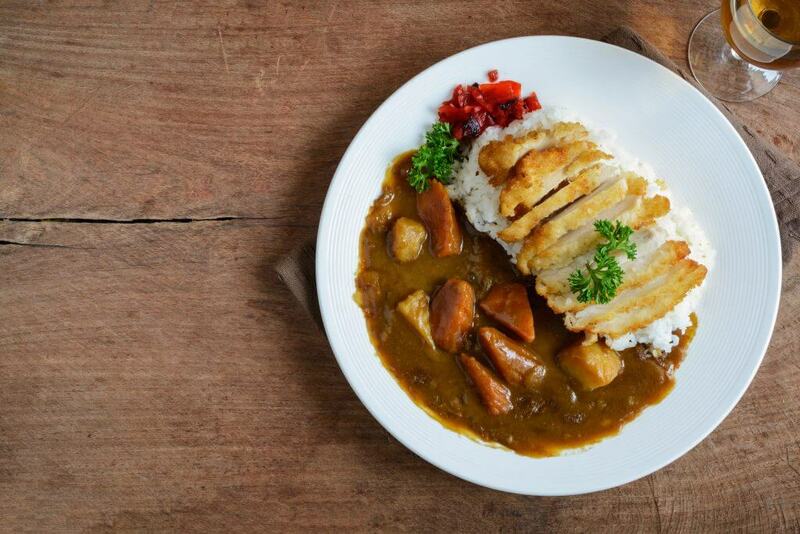 Japanese curry is quick to prepare and can wow your dinner guests. 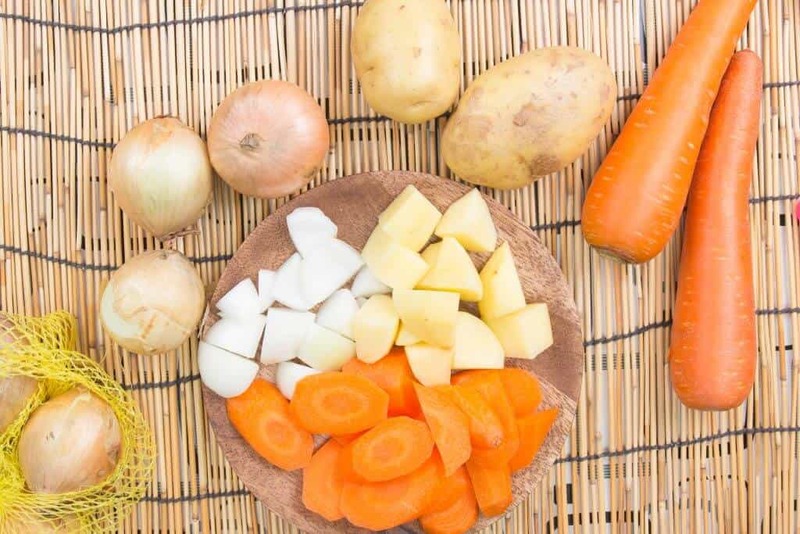 Follow this step by step procedure and learn how to make traditional Japanese curry. In this guide, we’ll list everything you need to know about creating amazing curry at home. All it takes is a few key ingredients to make the magic happen. Don’t worry if you aren’t a pro in the kitchen. This recipe is simple to follow and you’ll be churning out batches of it in no time. This curry is particularly good to make in large quantities because making three or four portions doesn’t require much more work than making one or two. If you have any leftovers, you can put them in the freezer and enjoy it on another day. 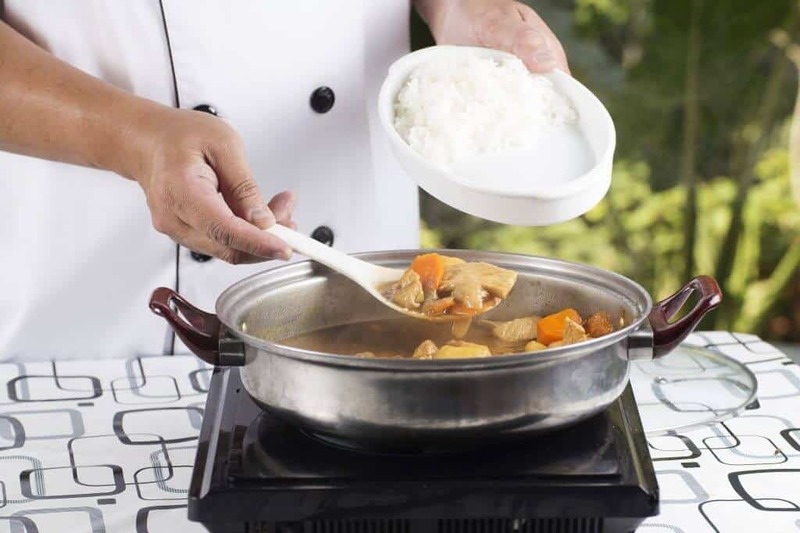 The magic ingredient to the whole dish is the “curry block.” Curry was introduced to Japan by the British around the early 1900’s, but by the 1960’s the recipe had changed to suit the Japanese palate and it was firmly established as a national favorite. Its popularity is evident by the number of curry products you can buy in the supermarket, including curry powder, ready-to-eat curry in packets, and the popular curry blocks. These blocks of ready-made curry roux are simple to use and come in a variety of flavors, with spice levels clearly marked. 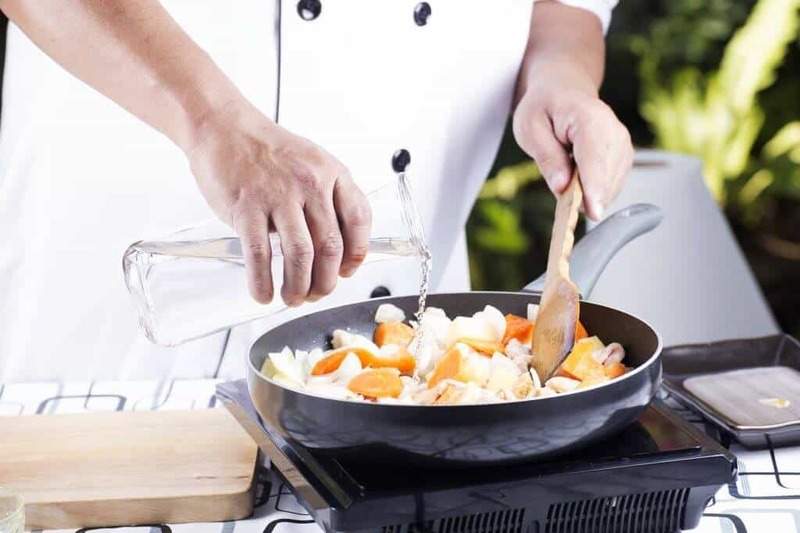 Budding chefs will no doubt have a go at making their own roux, but for the hard working salary man or the busy housewife, curry blocks are a top choice. Instructions (often with handy picture guides) are printed on the back of the box, and the method of preparing the curry is generally the same, regardless of which brand you buy. This recipe is for a standard chicken curry with traditional vegetables, but you can easily adapt the recipe to suit your needs. You can create a new curry dish just by changing the type of meat or vegetables you use. That’s one of the great things about Japanese curry – it’s simple but diverse, and can easily be changed to suit your preferences, so be inventive and have fun with it! Prepare the chicken: Cut the chicken into bite-sized chunks and seasoned with salt and pepper. Prepare the vegetables: Chop the onions into wedges and the potatoes into bite-sized pieces. 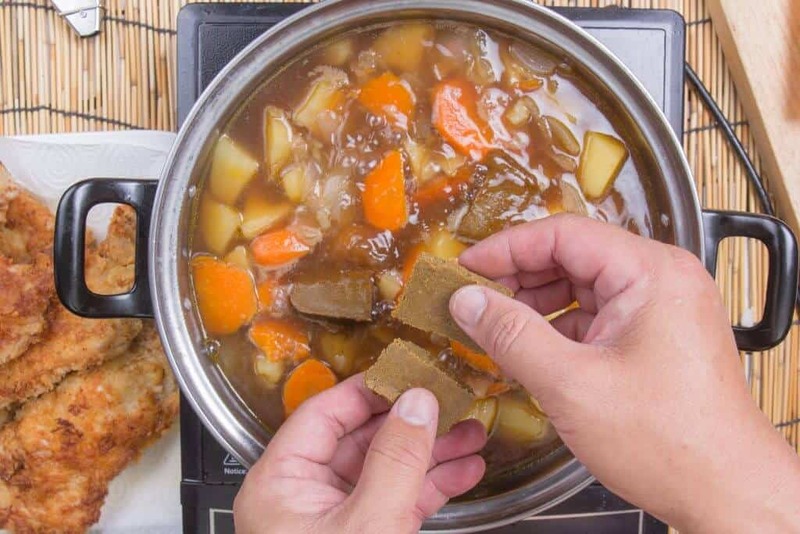 In a traditional Japanese curry, the carrots are cut in the “rolling wedges” style, but you can cut them any way that you want if you aren’t familiar with this technique. If you want to learn how it’s done, check out the video below. Heat a little oil in a large pot and fry the onions until they start to turn soft, but be careful not to let them crisp. Add the chicken chunks and fry on a medium heat until gently cooked through. 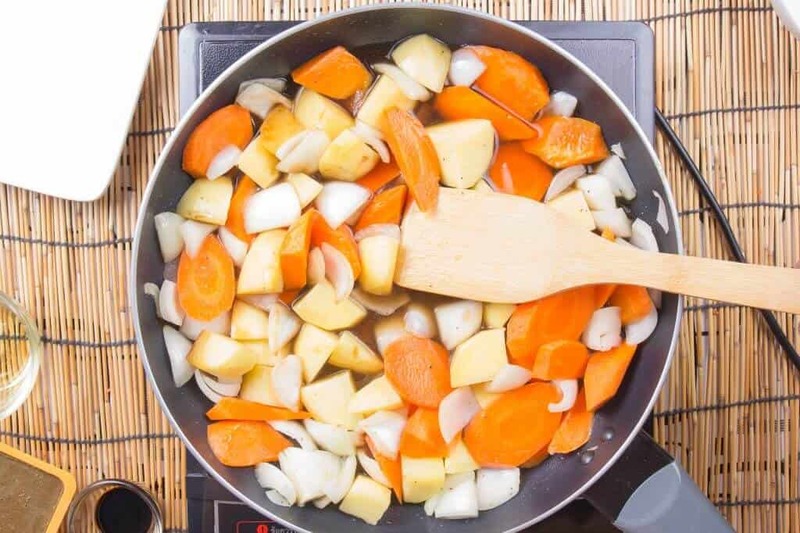 Add the carrots and potatoes to the mix, then pour enough water into the pot so that it just covers the ingredients – you want enough water for everything to boil nicely, but too much will turn the curry into a soup. 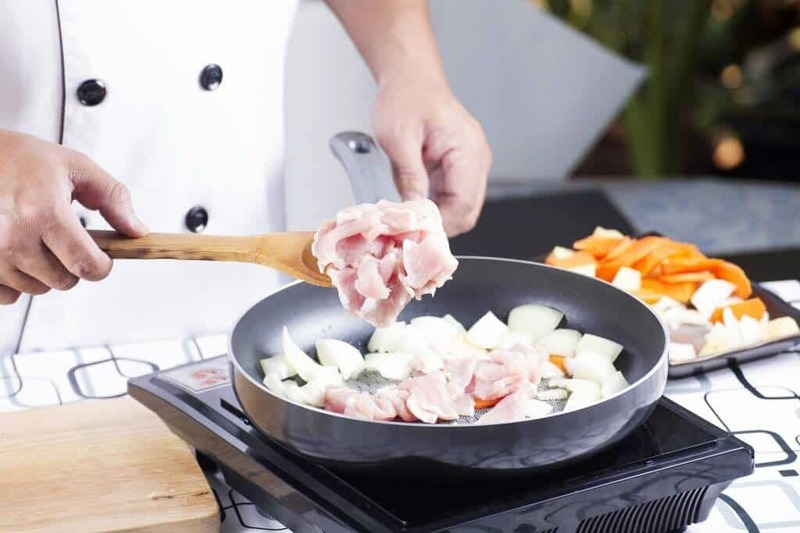 Let everything cook until the vegetables are soft – depending on the size of your chunks it could be anywhere from 10 to 20 minutes. Once everything is cooked through, add the curry blocks. (See below for details). Let it simmer for a few minutes to thicken up. Typically served over rice, you can also add pickles or half a boiled egg for a real Japanese touch. (See below for further ideas). Each box usually comes with two packs, and each pack has four or six little blocks which you can break off. Place the individual curry block in the middle of a ladle, and lower into the mixture. Let some of the liquid from the broth dribble into the ladle and moisten the block. 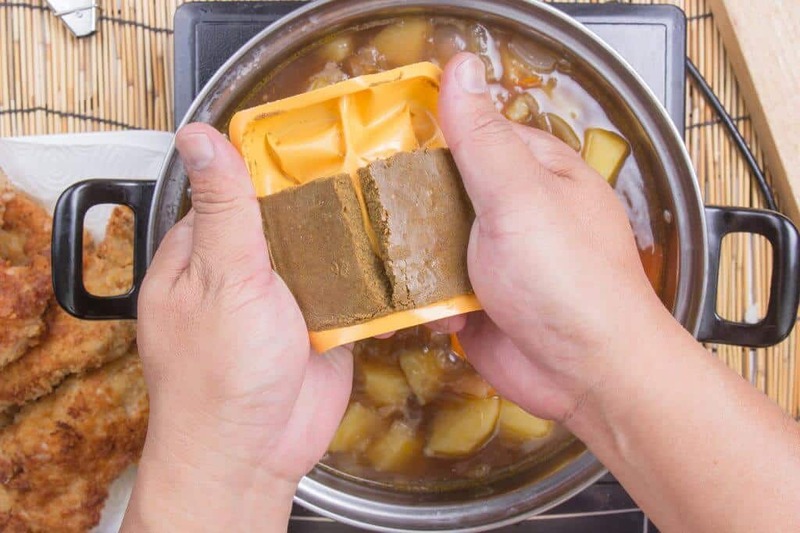 Using chopsticks or a spoon, gently agitate the curry block so that it dissolves in the broth, occasionally letting the curry broth dribble out from the ladle and be replaced with fresh broth. In this way, the curry is slowly added to the mixture and you don’t get any lumps. After adding each block, give it a stir to make sure the curry is thoroughly incorporated into the mixture. Following the instructions on the box will sometimes yield a curry that is quite liquidy and more like a curry soup. If you want a nice, thick curry, you can continue adding the roux blocks until the curry reaches your desired consistency. Some people prefer to place the curry blocks on top of the mixture (as seen in the video below) but there is a chance that it won’t mix in as well, so I prefer to use the first method. However, if you do choose to put the curry blocks directly into the pot, be sure to turn the heat OFF before doing so. When the blocks completely dissolve into the curry, then turn the heat back. The above recipe uses chicken but you could just as easily use pork, beef, fish or seafood to your mixture. If you’ve been to a Curry House Coco Ichiban ya restaurant then you’ll be familiar with all the dozens of extras you could have served on top of your curry, many of which are easy to emulate at home. One popular choice is katsu curry. You can buy breaded pork cutlets ready-made at most Japanese supermarkets or prepare them yourself. For vegetarians, delicious combinations of vegetables include tomato and asparagus curry, spinach curry, or mixed mushrooms. Another common way to eat curry is with a potato croquette on top. While curry served with rice is the most well-known option, it is also popular in Japan to serve curry with bread (often in the form of curry pan – a doughnut filled with curry that you can eat hot or cold that is available in most bakeries, convenience stores, or supermarkets) or with noodles. 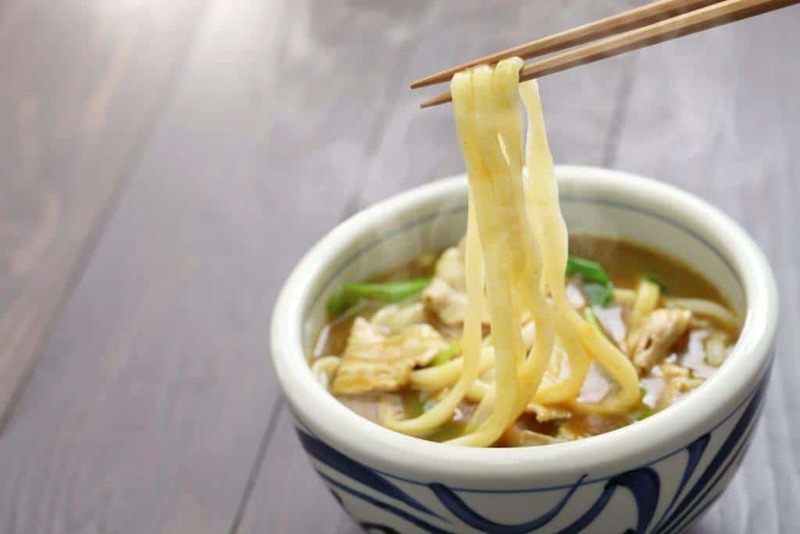 Udon noodles are the best option because they are thicker than other noodles and soak up the curry flavor well. Once you get good at the basic recipe, you can also up your game by adding extra ingredients. 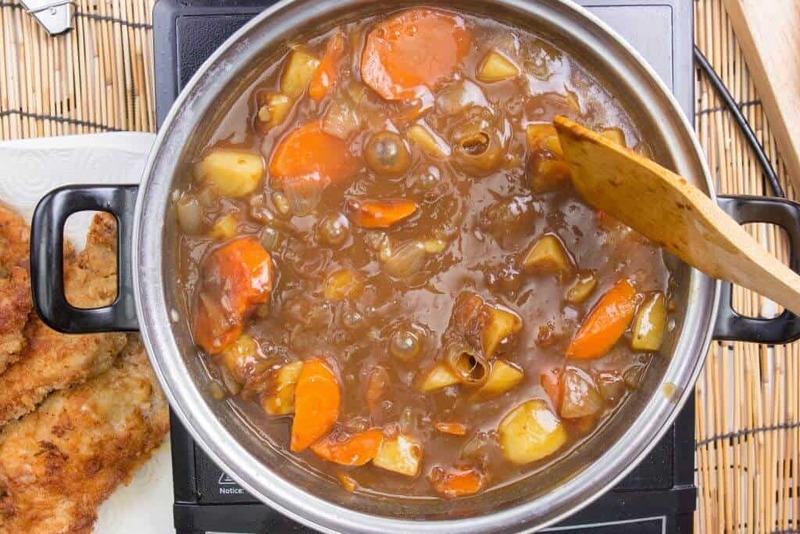 On the Just One Cookbook recipe for Japanese curry they suggest adding extra ingredients to bring out the flavor, such as ketchup, soy sauce, stock (instead of plain water) honey, apple, garlic, and ginger. If you think the idea of having apple in curry is unusual, it’s actually quite popular and you can buy curry blocks that already have the apple and honey flavor in them…although I don’t think you can particularly taste them. However, it is true that Japanese curry is generally much sweeter than curries from other nationalities, and even a pack of curry blocks with the highest spice level is unlikely to compare to hot curries that you get in the west. I don’t like super spicy curry at all and always opt for mild flavors, but when we buy curry blocks in Japan we always go for something with a number 3 rating – middle of the road but, honestly, not very spicy at all. Traditional curry with rice is served either in a bowl or on a plate, but is almost always eaten with a spoon. Even with adding extra curry blocks to thicken it up, Japanese curry is much more of a liquid than other curries, which makes it convenient to mix into your rice. 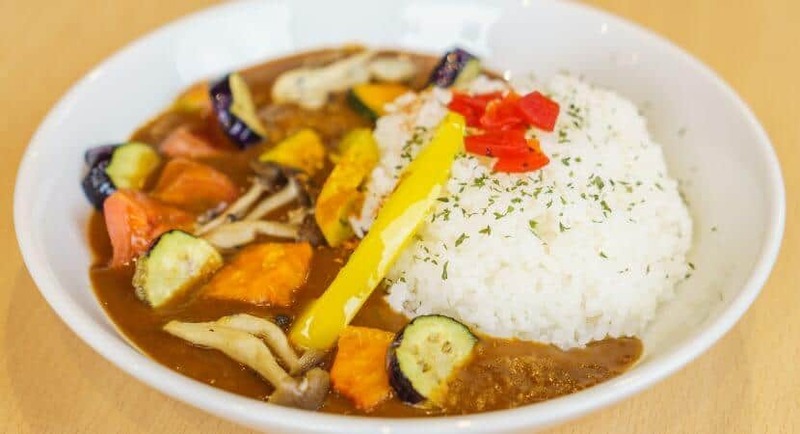 In recent years, people have been going crazy for “Dam Curry.” Rather than having the curry and rice all mixed up together, the rice is built across the plate like a sort of dam which keeps the curry from mingling with the other ingredients. You can watch the curry slowly seep through to the other side of your plate, or smash it up with your spoon and cause the dam to break its banks. Bet you didn’t think that making a delicious Japanese curry would be so simple, right? 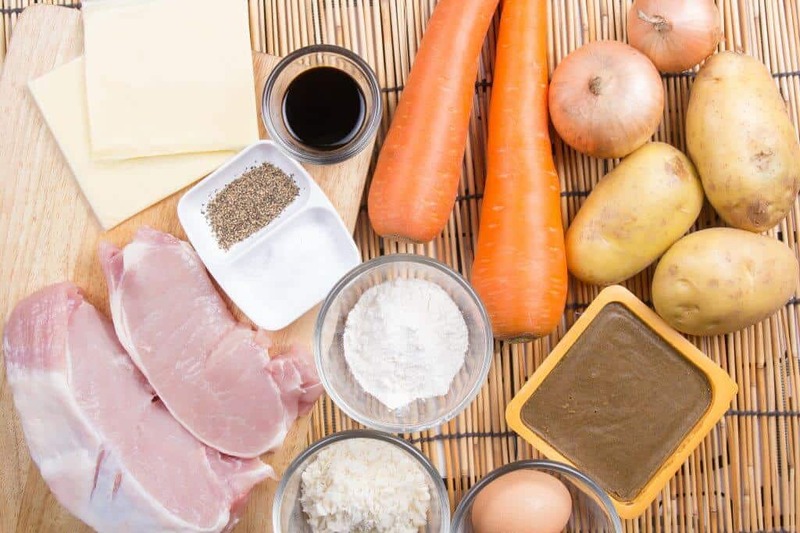 Japanese curry is one of those great recipes where you can just use basic ingredients to get a nice and quick meal out of it, or you can go all out and add other ingredients like homemade katsu or a perfectly prepared onsen egg. Have you tried making Japanese curry before? Share your tips and let us know what your favorite toppings are. I’ve got a penchant for the sausage and cheese option, but perhaps you fancy something more traditional. Let us know in the comments below!